For an overview of all methods supported by the Secure Fields Form, see the Secure Fields Form Reference. When card information is submitted through the Secure Fields Form, PaymentsOS returns a token representation of the card to your site. If you added additional fields to the form, then these fields are included in the token representation of the card as well. You must use the token when accepting payments. Now embed the Secure Fields form and set your environment (either "test" or "live") by calling POS.setEnvironment(). Then display the form&apos;s fields by calling POS.initSecureFields(). As a last step, attach a click event to the form that is invoked when the form is submitted. Pass the event a function that will send the card information to PaymentsOS, tokenize the information and return the token to your site. // Set your environment. Values are either "test" or "live". // If omitted, the test environment will be used. // information in your site. By default, the Secure Fields Form will show input fields for the card’s number, the card’s expiration date and the card’s CVV code. You must add a field for the cardholder’s name, since this field is mandatory (the field itself is not part of the iFrame generated by PaymentsOS). Depending on the provider that you are transacting against, you may need to add additional fields to the form. These fields will then be included in the token representing the customer’s card. For a list of additional fields that can be included, see the Create Token API. To add an additional field, simply add it as an input field to the form. Then include its key and value in the additionalData object. The key must be identical to the attribute name required by the Create Token API. Here’s an example of adding number and type fields that define a user’s identity card. // is of type object. 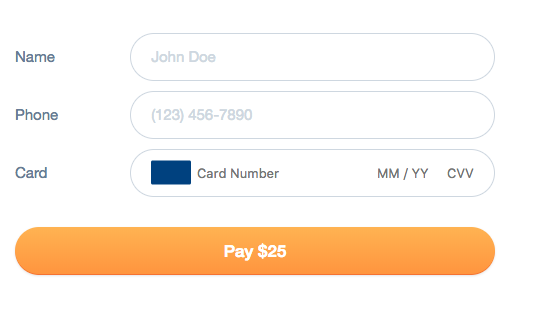 Customizing the form’s look and feel is easy. Simply add a style constant in which you define the styles for the form’s input fields. Make sure to use camelCase for the style attributes (and not kebab-case, as you are accustomed to when writing css). You can only use the style constant to style the form&apos;s default fields. If you add any additional fields to the form, you will need to provide your own css to style them. Here’s an example. Notice that the base attributes are common to all input fields. You need to call POS.setStyle() for your changes to take effect. // Here you can style the span element that wraps the secure fields. // The default values are shown below. // The Primary Account Number (PAN) field is always included in the form. // You can style it here. // The expirationDate field is always included in the form. // Unless you disable the cvv field, it will be included in the form. // Done styling? Let us know, so that we can apply your changes.